Monday through Sunday, 8 a.m.-2 a.m. Located on the waterfront with panoramic views of the Currituck sound in Duck, NC, Sunset Grille and Raw Bar is the premier dining and entertainment destination on the Outer Banks. Enjoy breakfast, lunch or dinner in the family friendly restaurant, or take in the beautiful sites of the sound while sipping a tropical drink on the 40-foot gazebo. With Caribbean themed indoor and outdoor dining areas, three tiki bars, an OBX sushi bar and breathtaking sunsets every evening, Sunset Grille has something for everyone! And, of course, let’s not forget the number one reason why people love Sunset Grille: outstanding Outer Banks seafood, steaks, pastas, drinks and more! We also offer watersport adventures right at our gazebo! Rent a pontoon boat for a sunset cruise with appetizers before enjoying dinner at Sunset Grille. View Sunset Watersports for more information. Also, be sure to stop by our sister restaurant located 1 mile south of Sunset Grille in the Scarborough Lane Shoppes in Duck. 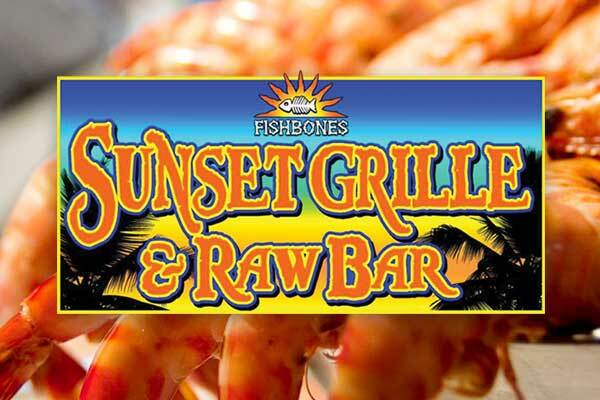 Visit Fishbones Raw Bar & Restaurant for more information. Serving breakfast at 8 a.m., lunch at 11:30 a.m., & dinner at 5 p.m. daily 7 days per week. Spectacular soundfront views. Specialty drinks (you keep the glass). Dock for boat access and watersports rentals on dock. 3 Tiki bars. Live entertainment in season (DJ, Karaoke, Bands).